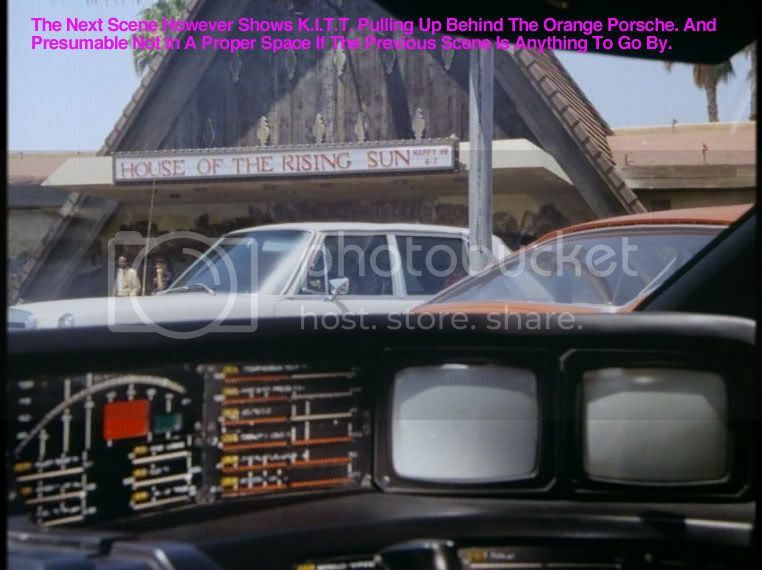 For years, many have wondered where, or looked for the location of the “House of the Rising Sun” from the pilot episode “Knight of the Phoenix”. A while back, I mentioned revealing the location. For those interested, I will now do so. The closest clue had been a place called “Cal Islands” in Santa Clarita”. That location was only a secondary filming location with similar characteristics used to simulate the primary location. One way to film two different scenes at the same time that call for the same location in the script. 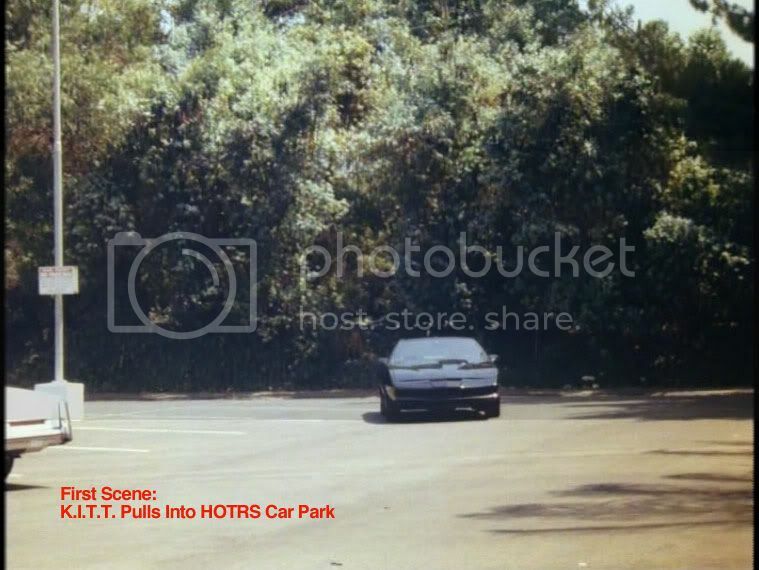 The parking lot of Cal Islands was used to simulate that of the “House of the Rising Sun” where Jackson (Michael D. Roberts) and Brown (Bert Rosario) drive up in their late 60’s Firebird and see KITT. So much for continuity – the parking spaces were painted different directions. Below is their logo sign and site pictures from 1972 and 1980. “Tennessee Gin & Cotton Co.” aka “House of the Rising Sun” is in the center of each picture. About the only remaining signs left are the parking lot lights and retaining wall at the tree line. The large red arrow is pointing to the corner of the building where it looks like the House. The small red arrow is pointing to where the Tiki style a-frame used to be. The next pic is the 1980 shot. 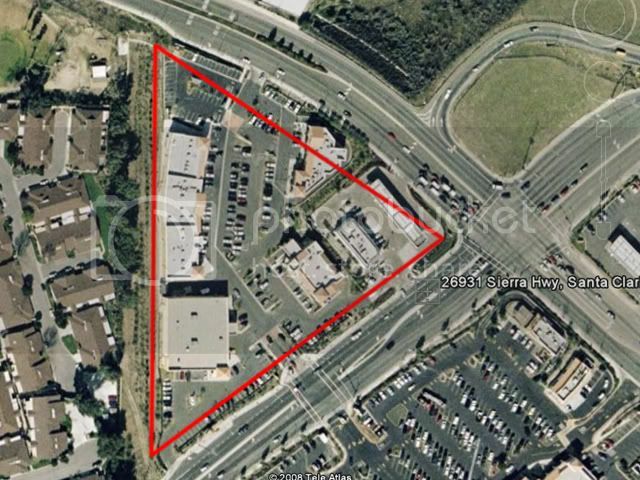 The large arrow points to the building and the small one points to what looks like the Tiki style a-frame. There is also lots of foliage and palm trees it looks like on the left of where the a-frame was. I think this may be it. Also, if you look in the lower right, there appears to be a house with a similar roof shape as that of which can be seen behind Michael's head. Hopefully someone will do a street view. I cannot get that to work on my slow computer. This may be it!! It really does have the characteristics and you can even make out the sort of L-shaped item on the roof that is just to the left of the a-frame which can be seen in the screen shot. I'm ready to say good job 1982!!! I just wish we could find an old photo of it from the front when it still existed. I've scowered images and have come up empty so far. All I get are cotton mills and tennessee stuff, nothing even remotely close to that building. Hopefully someone will dig up a photo somewhere. Thanks Bryan, and thanks for the arrows. They point out the correct spot. I can assure you it is indeed the correct location. Pictures are far and few if any, at least publicly. Privately, I know of group cast pictures at the location. For a comparison between then and today, there is one way that I know of. Back in the early to mid 1970’s, there was a TV show called Cannon, starring William Conrad. 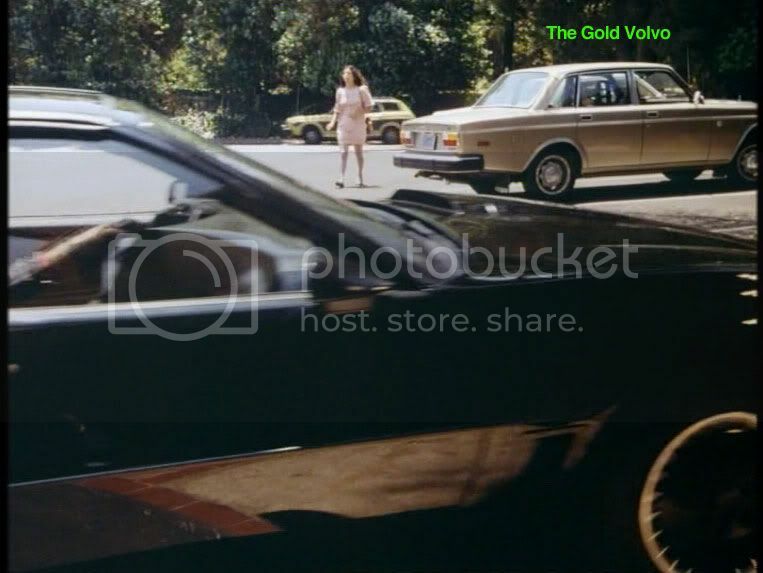 In a 1972 episode called “Murder by Moonlight” the script lists a scene at Ventura Blvd and Corbin Ave. If someone has the show on DVD, it should show the location. It should be a “bus” scene with Conrad as a passenger. A set of screen shots should do it. 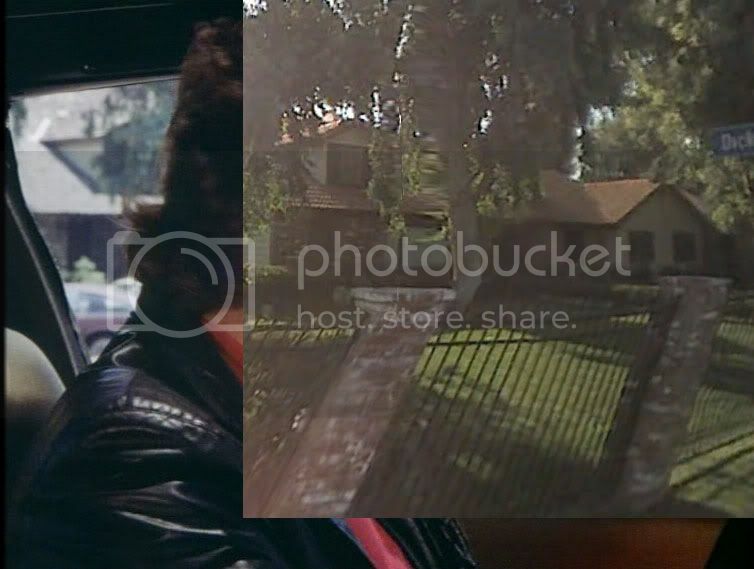 As can be seen from my post count, I seldom post on here , but I read this thread frequently, I have to say, major props to 1982 on finding/knowing/naming this location, surely one of the Holy Grails (along with the cube Comtron HQ) of Knight Rider locations. I've posted a couple of Google Earth Street View images for Bryan so that he can see the location. I've linked to the original image posted by Handzus' Stupid Fro for an easy compare, the house roof in the background can clearly be seen (I would've taken a screenshot from closer, but a tree covers the distinctive roof shape). Also, the same white, concrete street light base can be seen in the car park. Really though, a proper brilliant find. I found that episode of Cannon on YouTube and watched the whole thing - sure enough, a bus passes the building! It's only brief and the building is mostly obscured by the bus, but it's the real deal! Awesome find!!!!!!!! Joe you were right about 13:05, you will see HORS as the bus passes by. Keep the good work, im from Puerto Rico and i'm a huge fan of Knight Rider since 1982 i was 6 years old, i recently bought my trans am for my K2000 conversion as soon as my savings let me afford it. 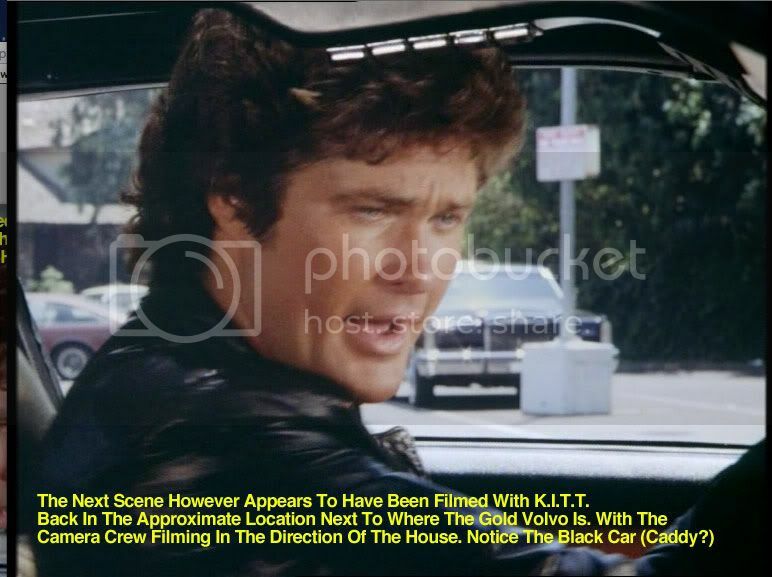 iGav wrote: As can be seen from my post count, I seldom post on here , but I read this thread frequently, I have to say, major props to 1982 on finding/knowing/naming this location, surely one of the Holy Grails (along with the cube Comtron HQ) of Knight Rider locations. In the picture below showing the “House of the Rising Sun”, and my aerial pictures, the parking lines are “right to left” with the parking layout and HOTRS being parallel to each other. The tree line being to the left of the building. Okay, I've just gone through the entire scene, and that screenshot is definitely taken from the HOTRS/Tennessee Gin & Cotton Co. location, and not the Cal Islands one. The house roof in the background is quite distinctive, coupled with the fact that it appears that no such style of house was built by the Cal Islands location. I've tried to get a better shot of said house from Google Earth, compare the distinctive roofline, as well as the pattern of brick work. 1982, the still you've posted is actually quite misleading in terms of establishing where K.I.T.T. is parked during the filming of the scene, in fact the whole scene is really one big continuity issue, but everything does plan out location wise if you follow the whole scene and match things up. I've roughly placed the location of each shot on the 1980 aerial photo of the HOTRS location, I've colour coded the text to match the scene location on the aerial photo/map. It should be easy to understand. Apologies about the quality though. I'm in total agreement iGav. 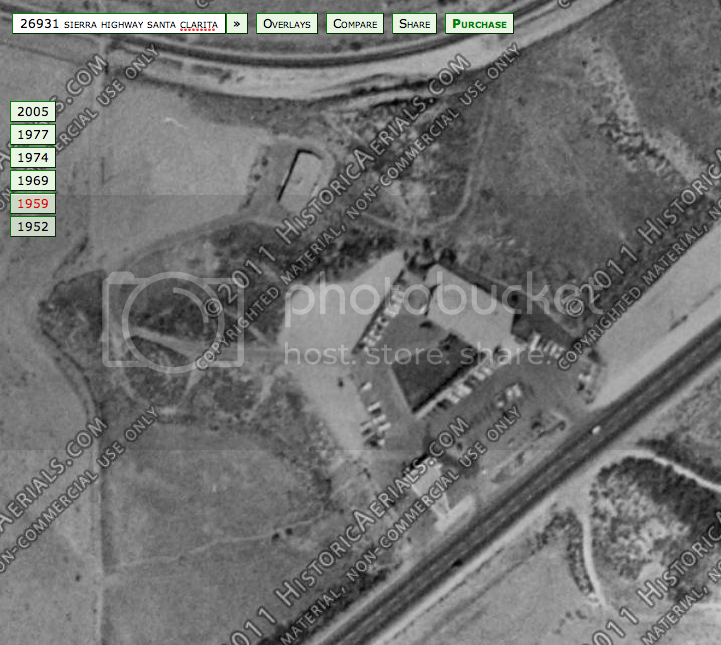 That's why I pointed out that house in my post (how you could see it in the lower right of the arial). The roof shape is dead on and your street view confirms it. Your illustration is pretty clear to me as far as the parking lines and whether or not that is the same house. Looks like it to me! By the way, the black car is a Lincoln. Good work! If you look at the scene with the bus from Cannon, watch the direction from where the bus is coming FROM. Look back down the road and you will see an underpass to the freeway. Then if you look at the satellite view on the web and look up Corbin Ave., you'll see the same freeway. The Ventura Freeway, the 101. That pretty much clinched it for me. Joe Huth wrote: I found that episode of Cannon on YouTube and watched the whole thing - sure enough, a bus passes the building! It's only brief and the building is mostly obscured by the bus, but it's the real deal! I did some search using the address and key words disclosed above and found no further images or videos of the HOTRS so far. Perhaps it burned down long enough before the digital/internet era. The 70/80 TV shows on DVD and YouTube might be the few sources to see HOTRS. So I want to re-post the following links (already posted in the "Locations ?" thread) of videos showing HOTRS. KentuckyKITT wrote: I'm in total agreement iGav. That's why I pointed out that house in my post (how you could see it in the lower right of the arial). The roof shape is dead on and your street view confirms it. Your illustration is pretty clear to me as far as the parking lines and whether or not that is the same house. Looks like it to me! By the way, the black car is a Lincoln. Good work! Ah, a Lincoln… of course my excuse for not knowing that is that I'm British. Wasn't the whole 'Car thieves trying to swipe K.I.T.T.' a later addition to the Pilot? (seem to remember reading that, but the specifics are all a little fuzzy now). That would go someway to explaining the differences in shooting locations, presumably they shot the car thief scenes whilst filming the Santa Clarita ones, given it's proximity as a location, rather than returning back to the HOTRS/Tennessee Gin location, makes sense I guess. Brilliant example of how being very specific with camera angles can make what is essentially an urban location, appear surprisingly rural. Shocking example of continuity however. one_man wrote: Perhaps it burned down long enough before the digital/internet era. 1982 said that the “Tennessee Gin & Cotton Co.” burned down in 1985, when you Google that name, a lot of people seem to remember it, and seem to speak very fondly of it as a hang out, it's funny, but for years it's been one of the holy grail locations to Knight Rider fans, yet anyone of those people would've been able to nail it straight away after been shown a photo of it. Before this location was disclosed, I was wondering what are the words embedded in the ceiling (see red box in the picture below). It all makes sense now! The partial cue to the HOTRS was hiding in the scene after all! TEN........GI.....C..TT..Co. <=== you can make out only a few letters! Tennessee Gin & Cotton Co. Okay, now it's time that we figure out where the main Comtron building is! Let's find it in 2012! Why is the Locations thread now split in 2? I always thought it's awesome to have all those locations at one place. iGav wrote: Okay, I've just gone through the entire scene, and that screenshot is definitely taken from the HOTRS/Tennessee Gin & Cotton Co. location, and not the Cal Islands one. IGav, yes, you are correct. Good call. An instance where a single picture is not enough to tell the full story. Thanks for the correction. I should have waited to post when I had my files handy, rather than use the pictures referenced in the “Locations” thread about the Cal Islands location as a matter of convenience. The house in the lower left of the picture below had looked similar, though not really clear. It is surprising that nobody else had earlier disclosed the locations of the HOTRS, or ComTron (the main building), given the many opportunities. Joe Huth wrote: Okay, now it's time that we figure out where the main Comtron building is! ComTron was another location with multiple film sites. 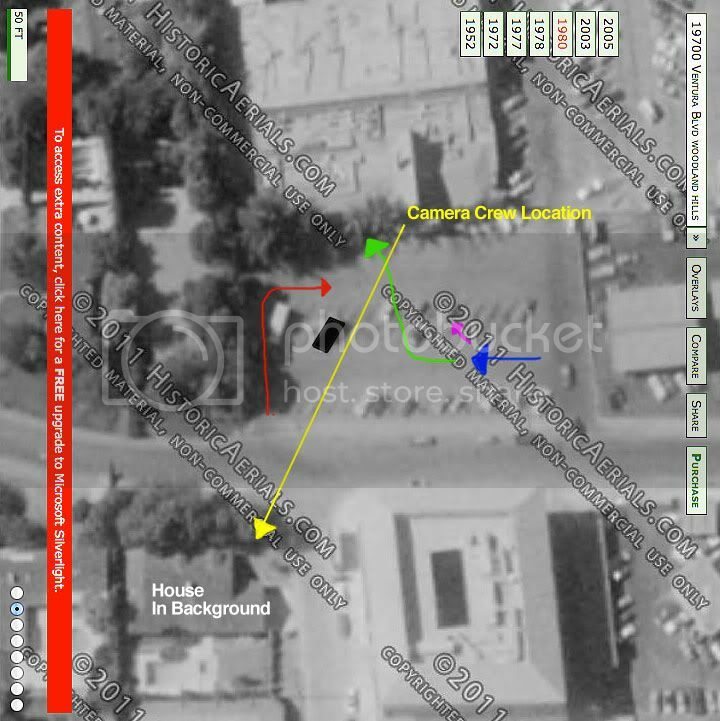 I gave and showed the one location on Crocker in the “Locations” thread used to simulate the ComTron entrance across from HOTRS with what I labeled “ComTron Building- B” (off of Stratford) in the background. 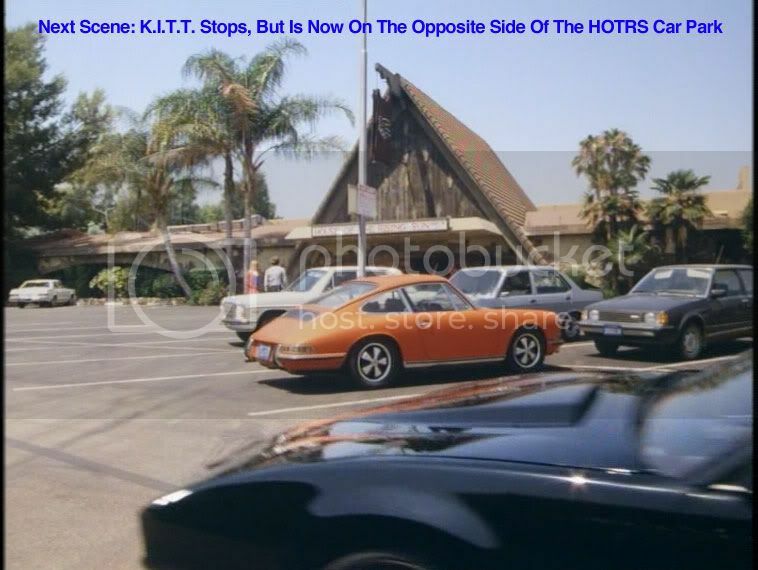 The night scene just before KITT crashes the gate leaving ComTron was shot in the lot at the same “Crocker” location using the other exit. The best way to find the “ComTron Building- A” location, or any other for that matter, would be from those involved in the scene. There is usually an interesting story and insight that goes along with it. It would be good for your book. 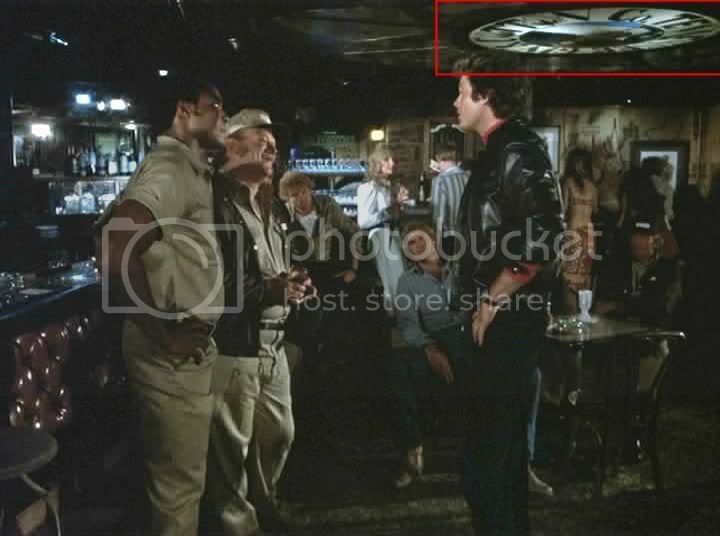 one_man wrote: Before this location was disclosed, I was wondering what are the words embedded in the ceiling (see red box in the picture below). It all makes sense now! The partial cue to the HOTRS was hiding in the scene after all! Good eye one_man. I never noticed it. 1) Awesome! I'm stoked that we can now check HOTRS off of the to-find list. In a way, I was actually kinda sad because I had been looking for it for so long. I had done a TON of research in the Santa Clarita region looking for it, but could never find anything of much substance. Oddly enough, even with what little information I DID have, Santa Clarita just didn't FEEL right to me - even though most of KOTP was shot there. 2) I fully believe now that Comtron (as in the photo above, not the secondary location) is somewhat NEAR to HOTRS. Logistically it just makes more sense because KOTP was filmed in basically two areas of LA - Santa Clarita and on Ventura around HOTRS. Just a hunch. 3) 1982... seriously. We have to wait another year? Weak. 1982 wrote: I should have waited to post when I had my files handy, rather than use the pictures referenced in the “Locations” thread about the Cal Islands location as a matter of convenience. The house in the lower left of the picture below had looked similar, though not really clear. It does look really similar doesn't it, but a quick look in Google Earth showed that the terrain where those houses are located, is in fact much lower, so that the rooflines are barely visible from the road. When you look at the area on Historic Aerials, in both '59 and '77 you can clearly see the Cal Islands buildings, and funnily enough, that is exactly the sort of environment I was expecting the HOTRS to be located, rather than the highly urbanised location it was actually located in. Do you actually know where it is, or is it something that you'll be researching over the coming year? How about throwing us a crumb or two if you do happen to know its location? Handzus' Stupid Fro wrote: 1) Awesome! I'm stoked that we can now check HOTRS off of the to-find list. In a way, I was actually kinda sad because I had been looking for it for so long. I had done a TON of research in the Santa Clarita region looking for it, but could never find anything of much substance. Oddly enough, even with what little information I DID have, Santa Clarita just didn't FEEL right to me - even though most of KOTP was shot there. 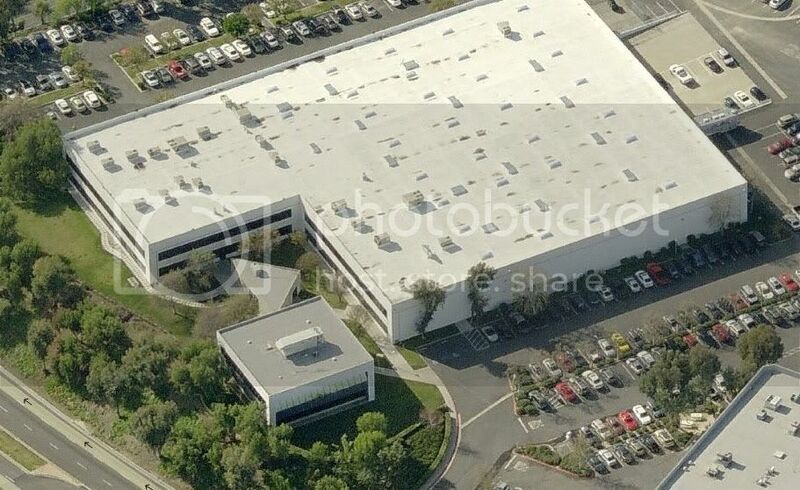 Whilst waiting for 1982 to reply, I have to say, I was wondering whether the main Comtron building was located somewhere other than in Santa Clarita (or that general valley area) too. However, what makes me doubt this, is that several scenes appear to suggest that the area around the Comtron building is quite hilly, and undeveloped (though obviously this could and likely has changed within 30 years), then maybe the Comtron building was/is located partially up a hillside, which is consistent with the scene where we see KITT being towed past the building (posted by Joe above). The backgrounds to the scenes below, show quite significant hill/s (Pic 1), as well as what looks like buildings below Comtron's level, (Pic 2) and building a little higher on a hillside (Pic 3). I'm assuming these interior scenes were filmed in the same building, because A) it makes logistical sense, B) in picture 2, the window frames are angled inwards, meaning that the windows are then protected by the the overhang, which is consistent with the exterior design of the Comtron building. Therefore, I'm not so sure that it would be located near the HOTRS, given how developed, and urbanised that area was even back in 1982. If I were a betting man, I'd say that the "main" comtron building no longer exists, just like the HOTRS. This is what makes finding these locations so difficult. I truly believe if the building was still there as it was seen on the pilot, then we would have most likely found it by now. Just like the HOTRS that burned down a few years after the pilot episode, I'll bet the comtron building was demolished at some point to make room for a new development. Apparently, only 1982 knows for sure. If the building still exists, I'm confident we'll find it this year, however if the building is long gone, we'll have to wait for 1982 to reveal the location. KentuckyKITT wrote: If I were a betting man, I'd say that the "main" comtron building no longer exists, just like the HOTRS. This is what makes finding these locations so difficult. I truly believe if the building was still there as it was seen on the pilot, then we would have most likely found it by now. Just like the HOTRS that burned down a few years after the pilot episode, I'll bet the comtron building was demolished at some point to make room for a new development. Apparently, only 1982 knows for sure. If the building still exists, I'm confident we'll find it this year, however if the building is long gone, we'll have to wait for 1982 to reveal the location. I think that's my inclination too, or at the very least it's been substantially modified. That said, neither the building or its landscaping at the time of filming look particularly old (very mid-late '70's style) so it's entirely possible that it survives, especially when one considers that much of the Stanford/Crocker area of Santa Clarita survives, which was developed in the late '70's, so it's not improbable that it might still exist. But that's if it's in Santa Clarita of course. I think we should keep an open mind to the Comtron main building location. Using Bing Maps in Bird's Eye View mode you can zoom in to just about any part of LA (save for residential areas) and see an office building or two reminiscent of the one we're looking for. While its attributes are relatively unique to us because we've been staring at it for 30 years, the reality is it's basically an abstract white cube of a building with black horizontal windows. These types of buildings are everywhere. There are also some continuity issues with the main Comtron building as well. 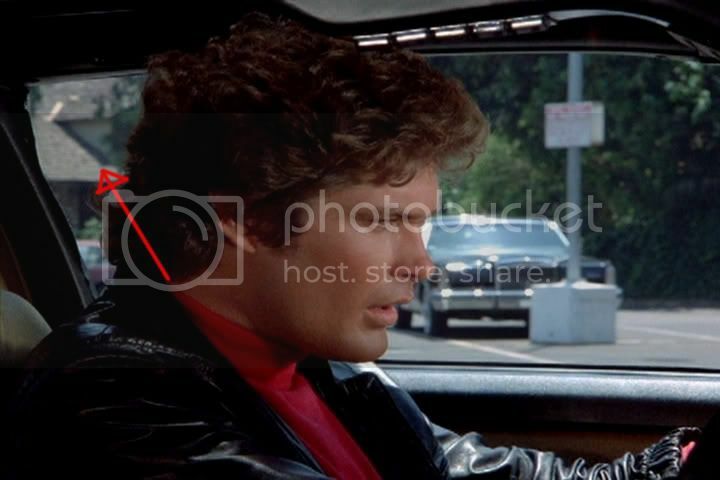 We see two different tow trucks towing KITT (both white in color, but only one has a company name on the door) in sequence but separated by a jumpcut. So the tow truck driving into the supposed Comtron complex could (and is likely) dirving down a totally different entrance than the actual Comtron parking lot, which we see in the 2nd part of the sequence. I do know what you're saying in regards to the "undeveloped" feel to the Comtron surroundings, but remember, it may not necessarily indicate an undeveloped area, per se. The greenery you see could be part of a golf course or a park of some sort behind the Comtron main building. If that's the case, there are parks and golf courses all over LA. One other thing to think about is the 3 hot ladies in the HOTRS parking lot scene. They supposedly walk from the Comtron complex on Ave Crocker in Canyon Country, across the street, into the parking lot of HOTRS - which we now know is way down off of Ventura. Not exactly across the street is it? LOL So, this logistically means that the three ladies had to shoot a sequence on Ave Crocker, and then travel down to the HOTRS to finish the parking lot scene there. One last thing to think about is the cast that was used IN the main Comtron building and the other scenes they were used for throughout KOTP. 1982 pretty much eluded to this as well. We do know where some of their scenes were shot - I think it's worthing investigating those general areas.